Samuel Zemurray (nicknamed "Sam the Banana Man"; born Schmuel Zmurri on January 18, 1877, in Kishinev, Bessarabia, Russian Empire, present-day Chişinău, Moldova; died November 30, 1961, in New Orleans, Louisiana) was a businessman who made his fortune in the banana trade. He founded the Cuyamel Fruit Company, and later became head of the United Fruit Company, the world's most influential fruit company at the time. Both companies played highly controversial roles in the history of several Latin American countries and had a significant influence on their economic and political development. Zemurray's birth name was Schmuel Zmurri. He was born in Kishinev, Bessarabia, Russian Empire (present-day Chişinău, Moldova,) to a poor Jewish family that emigrated to America when he was 14. Zemurray had no formal education. He settled in Selma, Alabama, where his uncle owned a store, and where he encountered bananas for the first time. He entered the banana trade in Mobile, in 1895, at the age 18. His early wealth was largely due to a very successful venture in New Orleans. Before Zemurray, the bananas that ripened in the transport ships were discarded upon arrival at the port, because they could not be delivered to market quickly enough to avoid spoilage. Zemurray bought the ripe bananas very cheaply and sold them locally and along the rail lines to grocers within a day of New Orleans. His success earned him the nickname "Sam the Banana Man". By age 21, he had banked $100,000. He later bought a steamship and went to Honduras. In 1910, he bought 5,000 acres (20 km²) of land along the Cuyamel River. He later added more land and found himself heavily in debt. At the time, the governments of Honduras and Nicaragua were working to reschedule their sovereign debt. United States Secretary of State Philander C. Knox was involved in the negotiations, which would have agents of bankers J.P. Morgan and Company sitting in the countries' customs offices to collect the taxes needed to repay the debt. Zemurray feared that he would be taxed out of business and appealed to Knox for help. Knox spurned him, so Zemurray returned to New Orleans, where deposed Honduran president Manuel Bonilla was living in exile. Zemurray contracted two mercenaries, Guy "Machine Gun" Molony and Lee Christmas, who along with Bonilla devised a plan to overthrow the Honduran government. Zemurray smuggled Bonilla back to Honduras, along with a ship full of powerful weapons, and Bonilla was successfully returned to power in a military coup. Bonilla then granted Zemurray the land concessions and low taxes that saved his business. In 1930, Zemurray sold his company, Cuyamel Fruit, to the rival United Fruit Company of Boston for $31.5 million in stock, and retired. United Fruit suffered financially because of mismanagement and the Great Depression, so much so that its stock declined in value by 90% after it acquired Cuyamel. This encouraged Zemurray to return to the banana business by buying a controlling share of United Fruit and voting out the board of directors. Zemurray reorganized the company, decentralized decision-making and made the company profitable once more. In 1953, the U.S. State Department and United Fruit embarked on a major public relations campaign to convince the American people and the rest of the U.S. government that Colonel Jacobo Arbenz intended to make Guatemala a Soviet "satellite". Zemurray authorized Edward Bernays to launch a propaganda campaign against Col. Arbenz's democratically elected government, which intended to expropriate some of the unused land owned by the United Fruit Co. and redistribute it to the local peasants. In 1954, the campaign succeeded and the U.S. Central Intelligence Agency helped orchestrate a coup that replaced Arbenz with a military junta led by Col. Carlos Castillo Armas. Zemurray retired as president of United Fruit in late 1951. He and his family made generous donations to Tulane University (including a large collection of Mayan artifacts discovered in banana fields), the Zamorano Pan-American Agricultural School, and to other philanthropic ventures, including the Zionist movement through his personal acquaintance, beginning in the 1920s, with Chaim Weizmann. Zemurray supported President Franklin D. Roosevelt's New Deal policies, helping to draft the Agricultural Adjustment Administration industry codes , and contributed financially to left-wing causes, such as The Nation magazine. despite Zemurray having written to The Nation in 1950 to dispute its earlier article which referred to the United Fruit Company as an "obstacle of progress in Central America". He created the Zemurray Foundation in 1951. 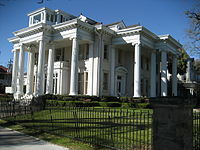 Zemurray died in New Orleans in 1961, where he had lived for most of his life; his mansion on Audubon Place was donated to Tulane University and is now the residence of its president. His daughter, Doris Zemurray Stone, an archaeologist and ethnographer, served as the director of the National Museum of Costa Rica and endowed various professorial chairs in U.S. universities. ^ a b Steven Heller (March 13, 2012). "America's Original Fast Food". Salon.com. ^ a b Cohen, Rich (June 6, 2012). "The Birth of America's Banana King: An excerpt from Rich Cohen's The Fish That Ate the Whale". Slate.com. ^ a b c Grushkin, Daniel (June 7, 2012). "Book Review: 'The Fish That Ate the Whale,' by Rich Cohen". Businessweek.com. ^ "Samuel Zemurray (1877-1961)". United Fruit Historical Society. 2001. ^ Buiso, Emily (March 17, 2008). "Banana Kings: The history of banana cultivation is rife with labor and environmental abuse, corporate skulduggery and genetic experiments gone awry". The Nation. Peter Chapman. Bananas: How the United Fruit Company Shaped the World. New York, NY: Canongate, 2008. The Associated Press. "Samuel Zemurray, 84, Is Dead; Headed United Fruit Company". The New York Times, December 2, 1961. Thomas P. McCann. On the Inside. Beverly, Massachusetts: Quinlan Press, 1987. Maggie Heyn Richardson, "Banana Man", Imagine Louisiana magazine, Summer 2007. Stephen Kinzer. Overthrow. New York, NY: Times Books, 2006. Rich Cohen. The Fish That Ate the Whale. New York, NY: Farrar Straus Giroux, 2012. Dan Koeppel. Banana: The Fate of the Fruit That Changed the World, Hudson Street Press.